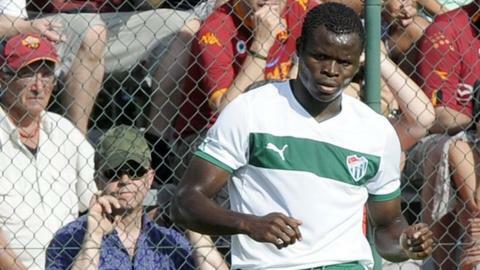 Bursaspor's Taye Taiwo admits he is pessimistic over his chances of making Nigeria's World Cup squad this summer. He has been pushing for a recall with 34 appearances for his Turkish side in all competitions so far this season. Current Super Eagles left back Elderson Echiejile has played just 16 times and only four times since moving to Monaco on loan in January. "I played at the last World Cup, but this one will be very difficult to be a part of," Taiwo told BBC Sport. Despite not having made his league debut for Monaco at the time Echiejile was preferred to Taiwo for the Super Eagles' most recent friendly against Mexico on 5 March. Nigeria coach Stephen Keshi is expected to announce his provisional squad for the World Cup next week and fans and media have been pushing for Taiwo to be recalled. The 28-year-old does not think his name will be on the list. "I've been out of the set-up for over two years so I am rather pessimistic than optimistic this time around," he said. "Without me playing a part, Nigeria won the African Cup of Nations and qualified for the World Cup, so realistically my chances of making it are very slim." Taiwo won the last of his 59 caps for Nigeria in a 0-0 Nations Cup qualifying draw to Rwanda in February 2012. Even though he has spent over two years in the international wilderness, Taiwo still hopes for a return to the fold someday. "I've not retired from the national team, so I will always make myself available for selection," he said. "I have always said it will be a great honour to represent the country once again. "The selection is done by the coach and it is his sole responsibility to decide who is good enough to make the squad. "The key to the future is to keep doing well with my club and hope for better days. "As a young player I was given my debut, so I can't completely rule out a happy ending to my international career." Taiwo made his debut for Nigeria in 2004 and played at the 2006, 2008 and 2010 Nations Cups. He has enjoyed professional stints in France, Italy, England, Ukraine and Turkey.